Or view larger version. An integrated parade of black and white men in Oakland, California. 1935. Moses L. Cohen, photographer. Gelatin silver print. Collection of Oakland Museum of California. The Oakland Tribune Collection. Gift of Alameda Newspaper Group. 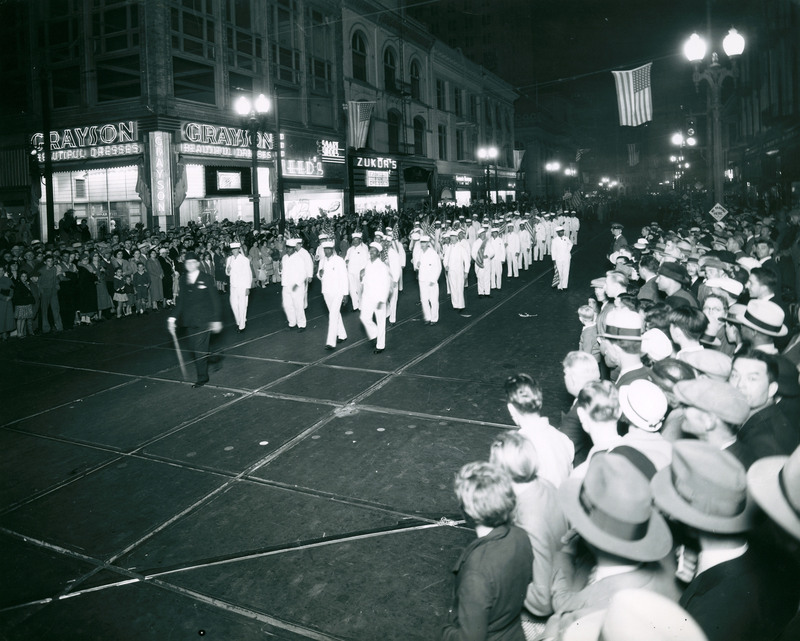 The purpose of this parade that progresses down an Oakland street is not made clear in this photograph of white-uniformed men. What is clear is that the group is integrated, with black and white men marching together. Such integration might be the expected result of President Franklin Delano Roosevelt's progressive New Deal policies, but in reality Oakland may well have been one of the few cities in the United States where such a sight would be readily accepted.